One of my all time favorite Christmas tracks with Elvis is "Merry Christmas Baby," recorded in Nashville on May 15, 1971. It also ranks high on my list over all the songs Elvis recorded. I remember reading somewhere that the song is so cool that you can enjoy it even on a hot August day. Pushing everyone else to eke as much emotion out of the song as he was ("Dig in, James," he cajoled; "Wake up, Putt"), he cruised through more than six minutes on the first take. There was ease and menace and delight in Elvis's after-hours performance, and the result has led more than one observer to lament that it wasn't a blues album rather than a Christmas album that had brought them together that night. In fact, the take lasted about eight minutes, and listening to the complete studio performance as released on Memories Of Christmas (1982) it's evident that Elvis doesn't want to let go of the song, repeating the lyrics over and over. "Well, I'm feeling mighty fine," he sings, and it's obvious that he does. 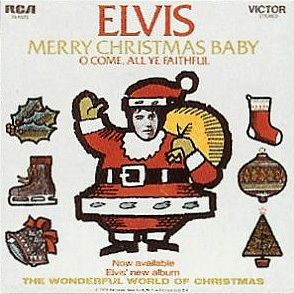 When originally released on the album Elvis Sings The Wonderful World Of Christmas in October 1971, "Merry Christmas Baby" was edited down to 5 minutes and 45 seconds and featured an overdubbed guitar solo by Eddie Hinton. The single release a month later (coupled with "O Come, All Ye Faithful") was a minute and a half shorter than on the album. An edited version with strings overdubbed (2:49) was used in the movie This Is Elvis from 1981 and can be found on the soundtrack (not yet released on CD). Four years later, in 1985, "Merry Christmas Baby" closed the excellent blues compilation Reconsider Baby (1985), this time a long edit without guitar overdub running for about 7 minutes and 20 seconds. Interestingly enough, this edit was included instead of the original one when Elvis Sings The Wonderful World Of Christmas was released on CD. Later this month will see the release of the FTD version of Elvis Sings The Wonderful World Of Christmas. According to the track list the second CD will include "Merry Christmas Baby" - take 1 (unedited version) with a running time of 8 minutes and 29 seconds. My guess is that those extra 30 seconds will turn out to be the studio banter described by Ernst Jorgensen in A Life In Music: "Just run through it a couple of times, Elvis told the rhythm section; "I'll come in somewhere." This must be the Elvis song which exists in most edits, I also have a single version from 1985 which is different. Excellent song, of course! Yes, I remember that single, coupled with "Santa Claus Is Back In Town," right? Another edit that I forgot to mention in my post is the duet version with Gretchen Wilson from Christmas Duets released a couple of years go. "I forgot to mention in my post is the duet version with Gretchen Wilson from Christmas Duets"
That's because that version is best left forgotten! Troy, I just gave the duet version a spin and I agree wholeheartedly with your opinion. It's been a while since i listened to it, I guess I just forgot to remember to forget it. while listening to the new release of the ftd Elvis Sings The Wonderful World Of Christmas, on disc 2 I noticed on Merry Christmas Baby that at 5:04 into the track it switches from the undubbed to the dubbed master until 6:15 then goes back to the undubbed version. Is this a faulty disc? The edit is very noticeable and a little out-of-place. Any info? "For some unknown reason this unedited version switches to the original album master mix (with a guitar overdub) approximately four and a half minutes into the song, and then back again to the undubbed mix about one minute and ten seconds later. This was also the case on the version found on Memories Of Christmas, but not on the slightly shorter edit (7:19) included on Reconsider Baby released in 1985. It would be interesting if Ernst Jorgensen could shed some light on this." So, obviously nothing wrong with your disc, but a mystery all the same.